Lunch yesterday was at Anatolia, which turned out to be the destination of choice for the caller and the band and several other groups of dancers as well. Because pretty much everyone else at the table had more English country dance experience in their left little toe than me in my entire body, I made like a sponge and soaked up as much advice and anecdotal knowledge as I could, especially about gender-free calling and global terminology, and I asked specifically about how to position my hands, which has been an ongoing trial, and has become more urgent to get a grip on (so to speak) because I want to become fluent enough on both sides of sets to wear the "I dance both roles" button with confidence. (I'm at the advanced beginner level where I still screw up regularly and sometimes mortifyingly spectacularly -- just ask the gent into whom I barrelled full speed yesterday after yet again brain-cramping on whether to pass right shoulder or left -- but am now experienced enough to steer or cue other dancers out of jams, of which there were a-plenty throughout the weekend. Among other things, I have "dolphin heys" down -- go me!). 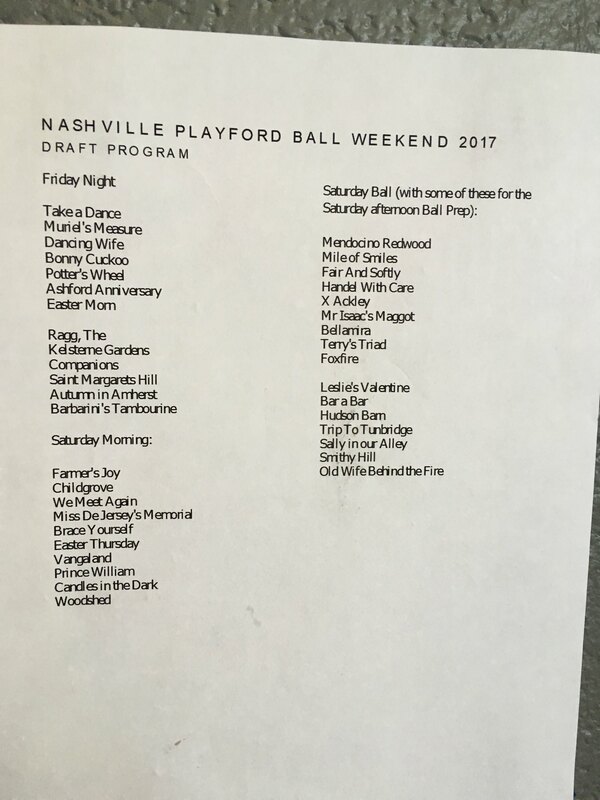 Maggie Cowan, a founder of QuickSilver, advised "thumbs to the right," and while my muscle memory hasn't gotten the hang of that yet, my brain was regularly repeating that throughout the rest of the weekend, so I daresay that will be my enduring takeaway from the 36th Nashville Playford Ball. It was a grand weekend. Wendy, my first partner on Saturday evening, quipped that she was glad she'd left her tiara in Charlotte since I was wearing one. The draft program got adjusted as programs do -- something with a name like "Fiddler's Feet" replaced "Childgrove," if memory serves, and there were some other swaps -- but we did end with "Old Wife Behind the Fire," after a "Smithy Hill" where Priscilla and I were having so much fun with it (especially after we got the hang of "swat the flea") that at least two other couples commented on our silliness, and a lovely bloke spun me around expertly through the final waltzes of Saturday and Sunday. As Honorary Mama observed during my phone call to her, the variety of dance names can be highly entertaining. I told her that I wore her prep school class ring (Class of 1946) through the final session, at some point realizing how appropriate that was, given her stories of social dancing lessons at that all-girls school. There were cameras at the ball, so I imagine there will be video soon (as there was last year). It seemed like more people made an effort costume-wise this year (perhaps because last year's postings took some by surprise). Current Music: Bare Necessities, "Wa' Is Me, What Mun I Do?"